In a large country like India with substantial service sector activity, it is important that the role played by NBFCs in credit provision is recognised. They have an extensive network and credibility among their constituents, both borrowers and lenders. In fact, for the unorganised sector they are the source of finance. But they are being given the short-shrift. 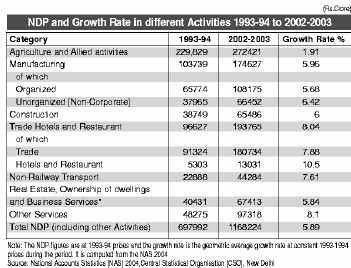 THE GROWTH in the economy in the last two decades has been propelled by the service sector and the Table provides the real growth rate (at 1993-94 prices) of Service Sector activities between 1993-94 and 2002-03. All have grown above the national income rate of 5.89 per cent. Hotels and restaurants has grown 10.5 per cent, trade at 7.9 per cent and non-railway transport 7.6 per cent. The service sector activities are substantially financed by non-banking financial companies (NBFCs) which constitute engines of credit growth. For instance, the share of trade in the national income in 2002-03 at factor cost at current prices was 13.3 per cent at Rs 3 lakh crore (out of Rs 22.5 lakh crore). Of this, the share of the non-corporate sector was nearly 80 per cent (National Accounts Statistics 2004) or approximately Rs 2.4 lakh crore. If 75 per cent needs to be financed (which could be an under-estimation as we are looking at value addition and not sale) by outside institutions, then Rs 1.8 lakh crore is the credit need of the trade sector. Bank financing of trade (non-food credit plus food credit) totalled Rs 72,057 crore in 2003 or about 40 per cent of the credit absorbed by the sector (RBI Annual Report 2004). In other words, more than 60 per cent of the financial requirement of the non-corporate sector in trade is met by NBFCs. This again is an under-estimation as a substantial amount of the food credit by banks goes to government organisations such as the Food Corporation on India. A similar analysis suggests that in un-registered manufacturing, the gross value addition was Rs 1,19,015 crore in 2002-03. Going by the estimate of 50 per cent from the Annual Survey of Industry (ASI) data, the share of short-term borrowing would be Rs 59,508 crore. Bank credit to small-scale industries was Rs 60,394 crore in 2003 (of which at least 50 per cent would be to registered category. This means more than 50 per cent of the borrowing requirement of unregistered manufacturing is met by non-bank sources. The share of the construction industry in gross value addition in 2003 was Rs 1,38,443 crore. Lending by commercial banks for housing activities in 2003 amounted to Rs 36,587 crore or around 35 per cent of the aggregate borrowing needed (75 per cent of value addition) by this industry. Thus, nearly 65 per cent of the private construction activity is financed by the non-banking sector. The P&P (proprietorship and partnership) sector has a large presence, more than 60 per cent in this industry. Remember that the truck financing activity is the most innovative and efficient symbol of the NBFC sector. Second-hand truck financing has created a fascinating backbone for the transport industry by focusing on the small man and this has been one of the major contributions of the NBFC sector to the economy. One can, therefore, say that the role of NBFCs in the credit delivery system in both manufacturing and service sectors is significant per se andcompared to the commercial banks also. But, unfortunately, the planners, instead of nurturing and enhancing their credit delivery mechanisms, are focusing more on control and regulation.The failure of some NBFCs has shifted the focus to their liability side while the asset, or lending, side is more important for an emerging market like India. Under the current RBI regulations, a butcher, barber or baker can borrow money but not a moneylender (Section 45-S of the RBI Act). A moneylender can lend but not borrow except from relatives. In the context of safe-guarding the interest of the depositors, we have gone to the other extreme impacting the credit market particularly pertaining to retail trade and restaurants which are dependent on the un-incorporated money-lender for their working capital. It is also possible that the deposit-taking activity has gone in to the `veil’ of unincorporated activities and it is much more difficult to “unveil” the un-incorporated situation than that of the organised sector. According to the latest Economic Survey, “Internationally, acceptance of public deposits is restricted to banks alone and non-banks including NBFCs can raise resources from institutional sources or by accessing the capital market only. The RBI is planning to hold discussion with the NBFCs in regards to their plan of action for voluntarily phasing out acceptance of deposits in line with the international practices” (Economic Survey 2004-2005). This does not fully reflect the situation as there are thrift institutions and financial companies in the US, and partnership firms, building societies and credit unions in the UK, which are similar to our NBFCs, and they play a large role in taking deposits as well as lending. They meet the requirements of what are called the mid-market households and small businesses. Also, remember that the structure of our economy is non-corporate (having a share of more than 40 per cent) compared to that of the US or the UK where more than 60 per cent of the economy is corporatised while in India it is around 12 per cent. The number of NBFCs has drastically declined in the last few years due to the RBI’s regulatory steps in terms of registration, rating, etc. As at the end of June 2004, a total of 38,050 applications were received for the grant of Certificate of Registration (CoR). Of this, the RBI approved 13,671, including 584 applications of companies authorised to accept/hold public deposits. It is possible that a substantial number of them, which did not get the CoR, have become active as unincorporated bodies. In 2003, the public deposits with the NBFCs totalled Rs 20,000 crore (less than 2 per cent of that with scheduled Commercial banks). Of this, 75 per cent or Rs 15, 000 crore was with five Residuary Non-Banking Financial Companies (RNBCs) such as Sahara (RBI’s Trend and Progress of Banking 2003-2004). The NBFCs’ capital risk weighted asset ratio (CRAR) improved substantially in the last decade, with quite a few showing above 30 per cent. The net NPAs of the NBFCs have declined substantially, from a high of 7 per cent in March 1999 to 2.9 in September 2003. The Planners may have some concerns about the RNBCs and even for that stringent investment norms have been introduced in June 2004. In a large country like India seeing substantial growth in service activities where the share of P&P firms is significant, it is important that the role played by NBFCs in credit provision is recognised. They have extensive network and credibility among their constituents, both borrowers and lenders. Their ability to access public deposits is the meeting point for their customers, since both are usually un-incorporated entities. Banks must treat the NBFCs as channel partners and provide them credit. But, at the same time, they should have the flexibility to access deposits from the public like any other financial institution. Being a lender without being a borrower from the public is like asking a teacher to only teach (output) and not study (input). Financial systems are fascinating learning tools where the input/throughput/output mechanism in terms of borrowing/processing/and lending enhances and enriches the institutions. If any one node is missing, then there is failure. A developing country like India needs multiple institutions catering to different segments and capable of accessing funds from the public, the market or from institutions. A prudent lender is one who borrows efficiently. It is actually two sides of a coin. Making institutions to lend without borrowing from the public will weaken the learning curve and goes against the cannon of the ” Triple Nodes” of a financial intermediary namely borrow, analyse/process and lend. Not the least, it may create moral hazards — if institutions only lend without borrowing from the public — in a country like ours. Let us have prudential regulation by all means but we should not throw the baby with the balti (bucket).